SuperS is everyone's least favorite more or less right? I was listening to a podcast recently where they just wrapped up that season and they bounced ideas off of each other about how the season could be improved and I thought some of them were pretty interesting? What would you do differently? I personally think Nehelenia is a really interesting villain because she had dreams and fears of her own that were not just the standard I am evil or jealous and they could have been expanded upon a lot more to make the series more interesting. Thats certainly a problem in my opinion with Sailor Moon in general obviously they more or less leave the final boss lady a mystery until the end and the motivations are not really explained much. I know the manga sometimes expands on these ideas a bit but not by much. I think Pegasus for example is a cool looking character I think it's interesting the way Chibiusa uses the bell to summon him and lend them the power up and all that but honestly does anybody really like the Helios Chibiusa stuff? I really hate the fact that they even need borrowed power it kinda makes them look weak. I think it would be interesting if elements from the SuperS movie were added. Since that movie also deals with the theme of dreams I think it would have been interesting to add elements of that film into the series. I think for example peruru is less creepy and threatening than Helios and I think the idea of trying to trap people in their dreams is a more interesting concept than just pulling out dumb mirrors that you don't even get to look into. It was pretty awesome to watch Usagi fight her way out of her dreams and let them go because they are selfish and face reality instead. What are you opinions would you change anything or is it totally fine the way it is? I will reflect on the 90s anime. For those who adore Chibiusa as much as me, this can be a bit of a stretch. The fact that Sailor Moon "needs" Chibi to transform coupled with animators who are relatively unwilling to create new content when existing content exists (which I understand) leads to a lot of repetition. The whole get out bell -> call pegasis -> tranform -> kalidascope is awesome the first time, and the second time, and the third time... but then I found myself skipping that 5 minute section. Perhaps it is not so bad if you are not binge watching this. The way that Tiger/Hawk/Fish Eye plan their hunt, lock their victims and stare into those dream mirrors is disgusting. Clearly there is a very prudent lesson being taught here and the message is very clear. In a way I am impressed the show is willing to tackle such issues, but it makes me terribly sad when I see these scenes. Prince Demand was pretty bad too but we didn't have to see the same thing play out for what feels like 10 episodes in a row there. So there is that. Supers explores a range of relationships both good and very bad and even looks at double-dating with Minako (who would of thought the guardian of love would be so clueless... but they do say love is blind). The relationship between Helios and Chibi is provided as an example of a good relationship, and compared to the other examples it soars high above the rest. I do like the care, sensitivity and respect they both show towards each other but I think Helios is wrong not to be more open from the beginning. The 2nd half of Supers is pretty good. I love the idea of a world of dreams. I like Nehellenia's character & back-story and the use of dreams/mirrors to force the senshi to reflect upon themselves. I think it is clever that Helios can be both a prisoner but also transcend this to be free at the same time. I would like it if Supers had focused more on these aspects than on searching for the golden crystal in dream mirrors. Maybe bringing Nehellenia into the picture a little sooner and expanding on the back stories of Zirconia and the Amazoness Quartet more too. And finally (you knew this was coming)... I would want for the Outers to play a role in the story. Cut down the amount of episodes the Amazon Trio had because they made the first half drag after a while. And cut episode 147 completely because it's terrible. Pegasus flies down too fast and accidentally spears Chibi Usa with his horn. I think a big issue with SuperS is that it does not involve the introduction of new protagonists, other than Pegasus. Other seasons were able to use fillers to assist in developing new characters, like the Senshi, but SuperS only has Pegasus and the villains. Obviously, there should've been more balance between filler and story development. Might've introduced the Amazoness Quartet many episodes prior to them becoming active commanders, and show a bit of rivalry between them and the Trio. Maybe that rivalry could add some sympathy in their desperation to accomplish their goal and become human. I wouldn't give Sailor Moon and Sailor Chibi Moon a shared transformation sequence, because it demands the characters are always in the same battle from start to finish. In addition, give Makoto and Minako individual power-up episodes and not recycle a storyline for them both. Also, power-ups happen much sooner in the season. And, of course, Outers be included in the season. May help make the episodes more unique in developing them as characters a little more. Maybe even add some humor to the usually serious Outer Senshi in filler with one of them as the leading Senshi for the episode's plot. I think it’s weird though how Stars did SuperS much better than SuperS did. The final battle with Nehelenia in Stars was pretty interesting. True, it was a little more intense in Stars. Though I'm not a fan of retcon. Rewriting Nehelenia as a lonely figure who really only wants friends instead of a vain queen (who stole all her subjects Dreams Mirror to stay beautiful). But staying on topic, SuperS could've used a little more of that darkness that Stars used for a final battle of the season. Outer senshi would have made it bearable. I think all of these suggestions are great! Write off Chibiusa in the beginning of the season and introduce a new Sailor Guardian to take her place. Heavily downgrade Chibiusa's role, and bring back the Outers (basically adapt the manga much closer). Let Kunihiko Ikuhara have full creative control. Actually, Super S isn't my least favorite season, and I don't have much of a problem with the Amazon Trio as a concept; for all of their faults I find them much more interesting than the Quartet. Battles take place inside dreams and Pegasus takes the Sailors into dreams. The Victims of the Day become monsters. The Amazon Trio subservient to the Quartet. The Amazon Trio want to become human by taking over dreams. The Quartet are themselves the Sailor Quartet who fought Nehellenia, then failed. Tie together this arc with R by having Nehellenia be the queen of the Black Moon. I don't see how Perle is less threatening and creepy then Helios. Helios was always a morally good character and helped the Senshi many times. Also I liked the Helios and Chibiusa stuff and Helios is my favorite match for Chibiusa. That would be terrible as even in the manga Chibiusa and her love for Helios is a big point of that arc. Yes they kind of overused Chibiusa to the detriment of the other Senshi in SuperS but it wouldn't be that good without her. Well Pegasus has a grown man voice and wont show himself in front of others and makes Chibiusa keep him a secret from the other senshi. It comes off as manipulative also the main thing is that the horse thing is gross. Peruru is just a little boy with wings so hes automatically less creepy. Helios is still a young boy really no different in age from Perle. As for a grown man voice this is only in certain dubs. Also he asks Chibiusa to keep him a secret so he dosen't make her a target. Also I don't see the horse thing as gross. It is the form he uses to appear to her. Besides it is not as though they would be intimate when they get older when he is a horse so again I don't get your distaste for him at all. Anyways though on the topic itself I have thought about how I would have done SuperS differently. For one I would obviously have less filler and more plot. Some filler is good but SuperS was way over balanced with filler. I would also include the Outers in the story. I would basically have the whole events of the Nehellenia arc and it's corresponding event in the manga to occur during the Amazon Trio arc with Setsuna coming back and asking to temporarily take Hotaru so she can watch over her development. I would have Hotaru age up to about Chibiusa's age but I wouldn't have the Outers get their Super forms yet. I would basically during the Trio arc keep the Inners and Outers in their first forms with only Sailor Moon and Sailor Chibi Moon getting their Super forms. This would for instance give Hotaru aka Sailor Saturn some episodes to kick but in her first form and I would have Death Reborn Revolution to be her first attack along with Silence Wall as a defensive. She would basically make a outer planetary ball of energy with her glaive and slash it at the enemy which would cause purple energy ribbons to come out and attack the Lemures. and I would have the Inners and Outers get their Super forms at the same time in the Amazones Quartet arc. I would give each Sailor Senshi their own episode like before where they show off their Super transformation and attack and the Outers would get their own Super transformations and attacks as well. Makoto and Minako would have separate episodes instead of sharing them like in R but Haruka and Michiru would share an episode together where they use Uranus Crystal Power Make up and Neptune Crystal Power Make Up with their Crystal Change Rods along with their new attacks. I would also have as for ages for it to take place the same year as S like in the original and the Inners still being in Jr. High and Haruka and Michiru being in Juuban High School. I would also have Hotaru to go to the same school as Chibiusa and become friends with Momoko and Kyuusuke. Setsuna would also be the school nurse there. 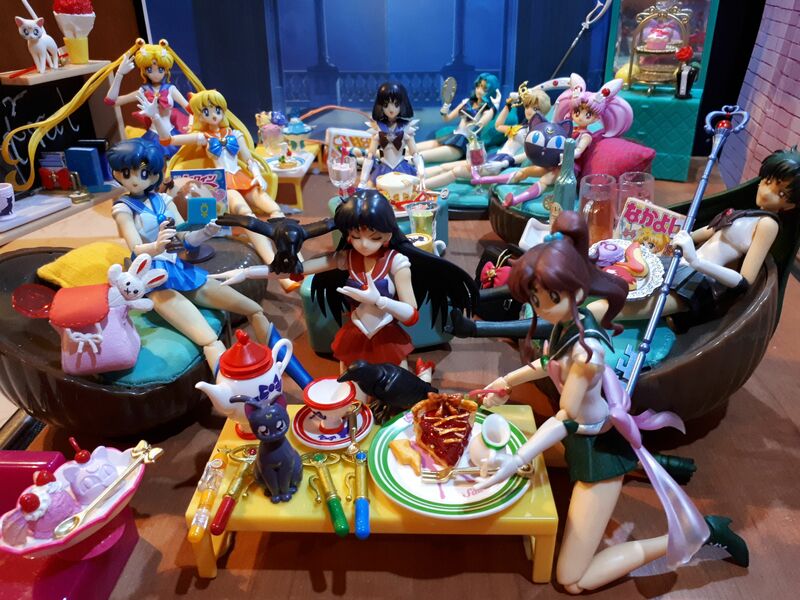 I would also have Haruka, Michiru and Setsuna to eventually move in with Hotaru and Professor Tomoe and help Professor Tomoe raise Hotaru. I would eventually have Setsuna and Professor Tomoe grow closer and eventually become a couple and get married and have Setsuna become Hotaru's stepmom. As for some plot differences I like the idea of the Senshi fighting in differing people's dreams. I would also for instance include Phobos and Deimos in the series to have their human forms and to become Rei's animal Guardians. I would even have them become Sailor Phobos and Sailor Deimos and be Sailor Mars's Sailor Guardians as well along with being her Sailor Power Guardians. I also would have included a new villain that would basically be the evil force in the mirror Nehellenia had that convinces her to take the dream mirrors of her people and tells her she would grow old and ugly which would be a lie. I would call her Queen Abyzou and base her off of manga Nehellenia and would have that it was Queen Abyzou who came to Princess Serenity's birth and who cursed the Princess and the Silver Millennium to fall but was sealed in the mirror by Queen Serenity who sent the mirror into space. The mirror eventually found it's way to the asteroid Hygiea (the Asteroid I was going to have to be Nehellenia's Kingdom) and came into her possession. I would probably have the final battle of the season take place in Elysion and I would have Nehellenia to be healed and made a child again and Abyzou sealed back into the underworld. 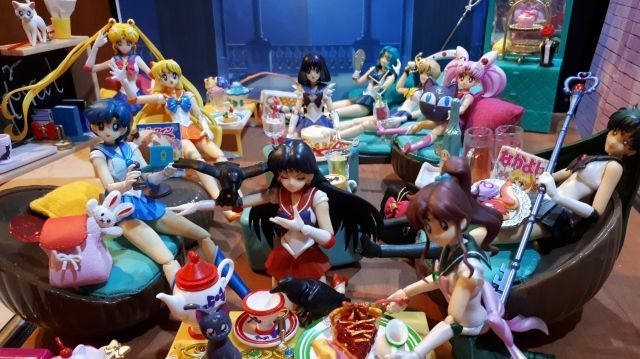 For the SuperS movie I would have it to take place in between SuperS and Sailor Stars and would feature all of the Senshi together including Sailor Saturn. I would also have that it would be Hotaru who falls in love with Perle as opposed to Chibiusa who would have her past relationship with Helios. In what versions does he not sound like a grown man? Because he certainly sounds old to me even in the Japanese. Anyway I am not implying it's not actually innocent but I am saying all the ways it looks and sounds ridiculous and why I personally don't like it. I actually really just dislike Chibiusa to begin with so when you sprinkle all this bizarre stuff that I personally find very boring It just adds up. Again it depends on who is his voice actor and even if he has a grown man's voice he is still supposed to be a little kid and again I see nothing wrong with how he is portrayed. Also I do like Chibiusa and find most complaints against her character to be rather foolish as I think she adds alot to the series. No she just ages much slowly. Long lifespans have become typical on Crystal Tokyo. Plus it is pretty much implied that Sailor Senshi are pretty much immortal unless an external force kills them off. I mean in the 90s anime Sailor Galaxia was alive since the Sailor Wars which were implied to have even occurred before the Silver Millennium or Golden Kingdom's were established.